A shorter than usual comment on Gregory Burke's contribution to this season's 'A Play, A Pie & A Pint' as I think giving too much away would be to the detriment of anyone planning to see the show. 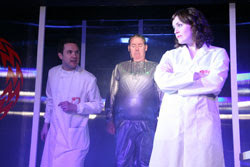 Set in a futuristic care facility for the elderly, Alan Bissett and Denise Hoey play up the comic elements beautifully as care assistants James and Kate, while Andy Gray is in his element as one of the residents. As well as generating plenty of laughs, Burke has several targets in his sights for more serious points, and more often than not he hits the mark. But with so many issues to pick off we've quickly moved on to the next one without following up the initial hit with a killer blow. David MacLennan's direction keeps things moving along at a pace and provides two delightful moments as Hoey and Bissett get a little closer to the audience. An entertaining piece of theatre from a writer with something to say, performed by an impressive cast at the top of their game. "Battery Farm" is a co-production between Oran Mor and the Traverse. It runs until Saturday 20th at Oran Mor and then at the Traverse from 23rd to 27th March. Image by Leslie Black Photography used with permission.